"Last week I started to download YouTube to MP3 as usual, only to find YouTube-MP3 not working. When I pasted the YouTube URL into the 'Input URLs' box, it just returns me immediately to the "Copy a YouTube link..." message without displaying the video title in the box as it should. I tried lots of different websites such as video to mp3, make it mp3, etc to no avail. Why do I get this problem and how can I fix it? Any help would be appreciated, thanks." Free YouTube-MP3 not working? Numerous unknown reasons to result in? Puzzled about the effective solution to fix YouTube-MP3 not working issue? Please spend a little time on MacX Video Converter Pro. This YouTube to MP3 downloader can ensure a seamless YouTube to MP3 process: 2-in-1 download and convert YouTube to MP3 at one stroke on Mac with 5X faster speed and original quality. More importantly, it can complete YouTube to MP3 download task with perfect aplomb, without any half-crash, freezing stuff happening. 100% safe and clean to free download! The YouTube to MP3 audio ripping site gives a messaging telling that "we are sorry, this service is not available from your jurisdiction." The site is still live but it's not working currently, or even worse, permanently, because the site is sued by several labels including Sony Music. The only thing you can do is to wait. Alternatively, you can use other online services or YouTube MP3 downloaders to rip YouTube to MP3 audio. YouTube-MP3.org has agreed to shut down permanently and hand over the site domain to RIAA (Recording Industry Association of America). It is only a matter of time that YouTube-MP3 is shut down. The site is still live on the internet. It's not impossible that YouTube-MP3.org returns with a different domain name. Q: Why is YouTube-MP3 not working? A: When we say YouTube to MP3 not working, we always refer to the YouTube.com to MP3 conversion websites as well as some disqualified YouTube music downloaders. As for the latter, the cause to the problem are just functional defects. However, the situation for the former is much complicated. Though most YouTube-to-mp3 sites are quite simple that users only have to copy and paste the URL of a video and press start before they get the MP3 file, Google has warned of "legal consequences" to sites that host this kind of activity and sent letter to some most popular converters, like YouTube-mp3.org. Google's legal action against YouTube-To-MP3 conversion website is the culprit behind most YouTube-MP3 not working problems. Invalid URL. YouTube video cannot be analyzed. YouTube-MP3 converter sites always pop up "Invalid URL" error message when your enter YouTube URL, and the YouTube video you throw at cannot be loaded at all. YouTube-MP3 won't work if the video you want to convert is longer than 20 minutes. Copyright infringement issue is also properly the reason why YouTube-MP3 is not working, with "Invalid URL" error message. "There is some Maintenance going on. All our servers are in read-only mode. Please try again within the nest hour." The maintenance error is other common YouTube-MP3 sites are facing. Most, if not all, YouTube-MP3 converter sites including YouTube-MP3.org have video length limit and users are only allowed to rip 20 or less videos to MP3 audio. You'll also get the maintenance error message if its server gets overloaded. Q: How could I fix YouTube to MP3 not working? Any way to download YouTube to MP3? A: Generally, there are two ways you can go to download YouTube video to MP3: YouTube to MP3 conversion websites or YouTube audio converter. Online website is an easy way to convert the YouTube videos to mp3 files. Most those online services are completely free with or without account registration required. However, there are some problems which will be discussed below. While YouTube music downloader may come with more features and higher quality, but you have to pay some money for it. Q: YouTube to MP3 conversion websites vs YouTube audio converter. Which is the better way? A: As for the two methods, YouTube audio converter is recommended. To understand why, let's get into issues you should note when use YouTube to MP3 conversion websites first, putting aside Google's battle against them as mentioned above. 1. Audio quality issue. With websites used, you can not always get MP3 files in high quality. It's nothing new that you get disjointed songs or undistinguished sound. 2. Format restriction. Only one output format MP3 is available if you use a YouTube to MP3 conversion website. Your devices that support formats other than MP3 can not play the output audio directly. 3. Long response time and incapability to download YouTube playlists are also frustrating. Get Rid of Any YouTube-MP3 Not Working Issue! 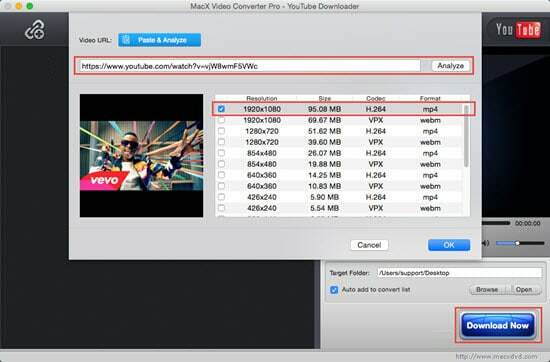 To cope with YouTube-MP3 not working problem with a professional YouTube to MP3 downloader which will not come with any annoying plug-ins and the like, here we highly recommend MacX Video Converter Pro. This YouTube MP3 downloader for Mac/PC is a simple but professional converter which offers an easy solution to download and convert YouTube to MP3 on Mac with fast speed and excellent quality. You are allowed to convert the downloaded YouTube videos not only to MP3, AAC, iPhone Ringtone, AC3, WMA, AIFF and other audio formats, but also to different video formats like YouTube to MP4, MOV, FLV, WMV, AVI, MKV etc. Q: How can I operate this YouTube to MP3 converter? Would it be complicated? A: The whole process is extremely simple and you only need to get the URL of the YouTube video you want to convert to MP3. Launch YouTube music downloader. Hit "YouTube" button and click "analyze" to load the YouTube video by copying and pasting the video URL from YouTube. Or click "paste & analyze" button to automatically detect the YouTube videos on the opening website page. Specify a destination folder for YouTube video by clicking "Browse". 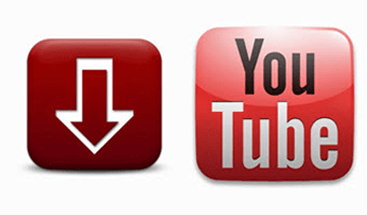 Click "Download Now" and start downloading video from YouTube. Note: This YouTube audio converter can download videos in any format from YouTube, including SD videos, HD videos, and UHD 4K videos to MP3. Select "Auto add to convert" and choose MP3 as the output format and the software will automatically jump to the conversion page after finish the video downloading. Then you can start to convert YouTube video to MP3.